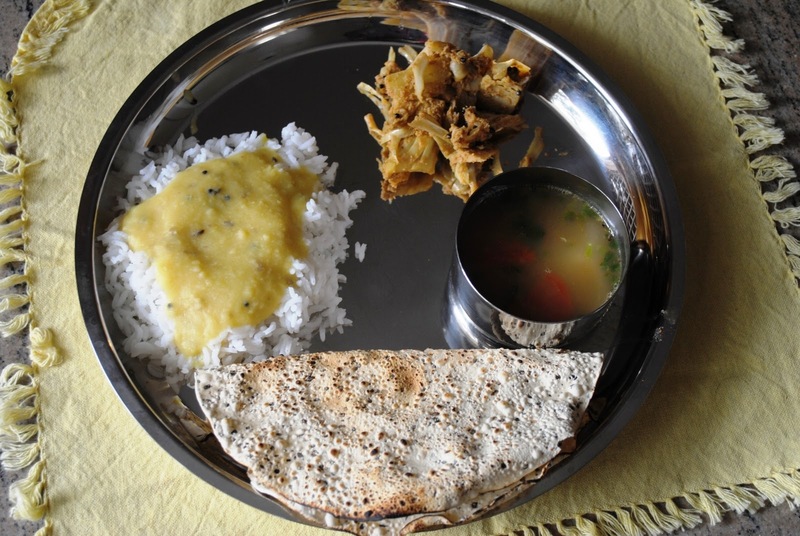 Sukke is a Konkani preparation of vegetables - a stir fry with spices which have a coconut and tamarind base. 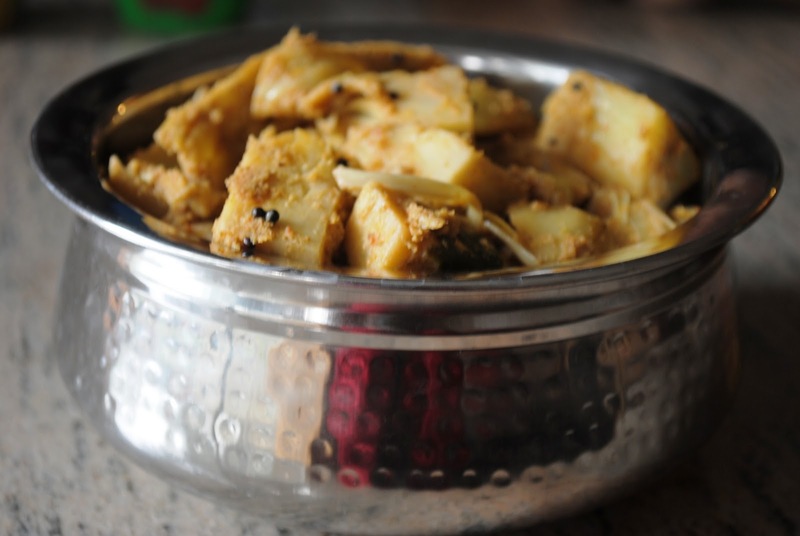 One of my favourites of Konkani cuisine - something I got acquainted with at my best friend's house when I was in college. I practically lived there when I was doing my post graduation - it was like coming home when I went over there on the weekends. And definitely the food was such a relief from the terrible hostel food and then our own cooking when I was living in a flat with 4 other girls. This was Saturday lunch for us - dal, roti/rice, kadgi sukke, milagu rasam and papad. The milagu rasam (a thin soup which is liberally spiced with black pepper-recipe in another post) was perfect for the weather and for hubby who was coming down with a cold. Happiness on a plate. 1. Clean and cut the jackfruit pieces in to 1' pieces and keep aside. Cook the pieces till done, in just enough water and turmeric powder - about 8 minutes. 2. Roast the red chillies, coriander seeds, fenugreek seeds in half a tsp of oil, then grind to a paste along with the tamarind and the fresh coconut. 3. Heat the coconut oil in a pan, add the mustard seeds to it-when it pops, add the curry leaves. 4. Add the masala paste and the cooked jackfruit and simmer together till well blended and almost dry. Add the jaggery and mix well. That is heaven in a plate. Is Sukke generally dry or gravy consistency? Kela sukke the recipe I found on Arch's Yum Factor blog is a big favortie and it has a grav consistency. @Indo, glad you liked my recipe...Sukke means dry in Konkani, but generally has a thickish gravy..
Indo - you're right, sukke is usually semi dry with a little bit of gravy....this was too, but doesnt show in the pics. love unripe cooked jackfruit to ripe smelly ones!! but so sad that while i do get that in the supermarket here i rarely buy cos peeling chopping is such a pain. 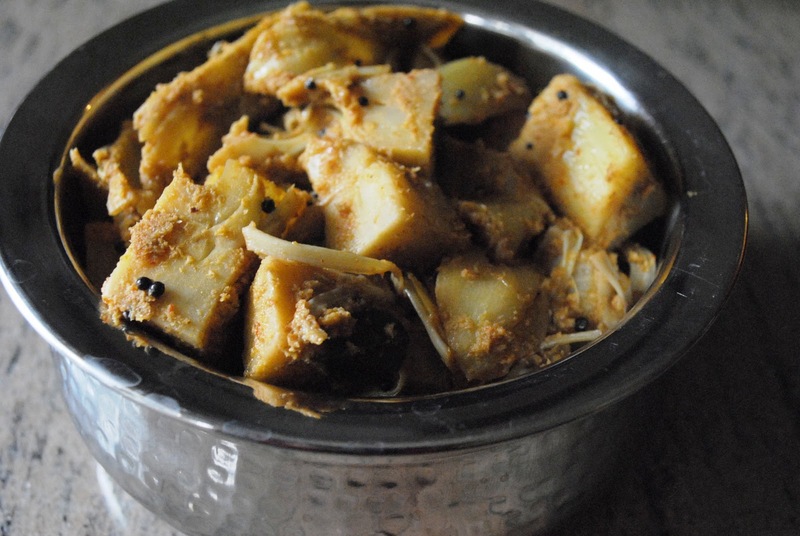 my favourite way of eating is the slightly young jackfruit idiyanchakka - made into a kerala style thoran. its boiled and pounded and then seasoned. I get loads of unripe jack fruits here, but the cleaning, slicing and oiling hands puts me off. Your stir fry tempts me to try it soon. Miri, you brought back lots of memories. My stepmom used to make jackfruit sukke all the time, and I do miss it because I can't find raw jackfruit here. I will just feast my eyes on your delicious pictures. Have had dry jackfruit curry in a Malayali household and liked it. I tried making it myself but it just didn't work. I don't see it too often in these parts. Unfortunately, I've only ever had tinned green/raw jackfruit, but I still love it (even plain they make a good snack!). I can only imagine what the fresh ones taste like, and even more-so when made into this splendid-looking Konkani dry dish- so tempting!